The Sierra Madre Tattler! 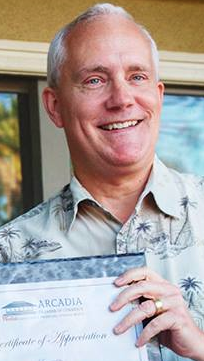 : Why is Arcadia Chamber Prexy Scott Hettrick Getting So Snotty With the Save the Arcadia Highlands Folks? The Arcadia Chamber Board needs to fire Hettrick. How can a Chamber that is supposed to be business and resident friendly have such a hatchet man as their public face? What a train wreck for the Arcadia Chamber. It was the Arcadia Chamber of Commerce that mandated back in the 1930 that the residents only sell their homes to White Protestant Christians. The same CC is now showing it's head in support of the vultures who prey on old homes. Mayor Comrade John "no ethics" Wuo, Roger "Senile Bully" Chandler and Sho "two face" Tay should all be packed early and sent out of state. This guy speaks on behalf of Arcadia's business community? And then bashes residents? He'll be lucky if half the Highlands doesn't start a boycott of local business. You can only wonder how much this jerk is being paid by the green card gangs. It's always "FOLLOW THE MONEY" and you'll find the truth. For many years now Arcadia has forsaken the locals for the money they can make. OH, do I recall Arcadia has taken more water from the wells than they should also? Arcadia is not so nice of a neighbor. No kidding. Apparently the town is run by jerks. Arcadia has a poodle government. They snap at the residents, but it is big Asian money that is holding the leash. Love your comment, 8:03. We Sierra Madreans learned long ago that you can't tell the good guys from the bad guys by their titles - prime example is SCAG. Weren't they supposed to help us little guys, and turned out to be working against our interests. Oh, yeah, and our representative Joe Mosca. That should certainly be a lesson in being careful of who you vote for! Mosca didn't have to go to any of the SCAG meetings. He already understood his orders. Gotta go to SCAG meetings. I believe the Council member that goes gets a $50 or $100 stipend for each meeting attended. Ka-Ching! Arcadia has mastered the art of businessless businesses. They're imitating Sierra Madre I guess. "...foremost indignant person." Tattler, you do have a way with words. I love "doofus housing" and "doofus development." Sure nice to have you back. It was totally disgusting to read all of your St Sandy the Queen of the Nothing for way too long. I began to lose faith in you. She is a real estate agent who is not in the school system. Please keep to what you know. And respect those who do know what is going on, like us teachers. Larry knows more and you know that cuz you moved outta the worst school system, and Dumb Sandy is the last person to fix anything. She does not know anything about running a classroom. The only reason I still think I might still love you is because of Lorie and your children. Besides, you do know behind every successful man is a more successful woman. Party for Larry here, soon??!!!! Respectfully, I disagree. When did you start to believe that outsiders are unqualified to make a difference? Larry and the other two dudes that were elected to the BOE were handpicked by the same people that have driven the PUSD down to its current deep dark abyss. It is about money, nothing else. These guys will fix nothing. As far as the people who shoveled all that money at them, they think things are just fine. The special interests are getting paid. The bond salesmen are cranking up their efforts. Nothing else interests them. Besides, anyone who trumpets the endorsements of Bart and Buchanan will never get any slack here. That I promise. I don't do support for corrupt politics. However, using propaganda techniques to associate a candidate with something he did not condone, going after a candidate's family, and trying to make one candidate's bad decision from decades ago an issue, especially when the candidate you promoted has a history of numerous bad decisions - all these supported corrupt politics. Darn it, I've been so happy that we were away from that awful election. But my 2 cents came from the fact that Torres taught at the most difficult kind of school, with the worst students. So the 30% graduation that the other side was ridiculing is actually an accomplishment. That showed that Sandy, or her campaign manager, just didn't understand what the school was. I have a right to disagree. Nor do I believe that much of what you are saying here is exactly true. Nor do I believe that those tactics you speak of weren't used by the Torres campaign. Perhaps you never saw some of the things I saw. They happened well before I got involved. And look at it this way, if I hadn't used similar tactics against Noah Greene the City of Sierra Madre would now be approving McMansions all along the hillsides. There is little to distinguish what I did in that election from what I did in the recent BOE election. 11:46 here. You're right that I never saw any of the bad stuff from the Torres camp. I don't think it made it out into the general public the way the Tattler does. I have since heard that it was awful, and of course I condemn that. I expect the Tattler to rise above anything like that, to focus on the real issues. The Tattler was better than the opposition, before. Green's absurd use of Facebook made him unqualified. Gotta love when so-called "supporters of education" support the union candidate (Torres) so more money will go in to salaries and pensions and no spending increases to the classroom level. Maybe that means with pay raises we won't hear the complaining about teachers buying supplies out of their own pockets, anymore? Anyone who wants to see what Torres supporters were putting out please send me your email address. It will sicken you. Mod, please stop saying 2 wrongs make a right. Heh. In politics anyone who thinks that anything is right are usually wrong. Not interested in seeing mud slinging, so won't send my email, but some insight: Teachers Unions have a lot of clout in the State of California, and they will unswervingly back a union candidate no matter what the qualifications. Torres might be a good teacher, but he is in no way qualified to sit on the PSUD Board of Education because he took huge amounts of money from the union, thus is beholden to them. The newly elected Three Stooges will start approving bond measures just as fast as Bart's little hands can write them. 12:25 - If I get permission I will post it. People need to see. No child of God ever deserved that. If you're going to post despicable material, please put some kind of advisory about it - or I'll just have to not read the Tattler again until the coast is clear. Just not interested in either the canonization or its opposite of Sandy Siraganian. Do you vote?.....then you support corrupt politics, we're all hypocrites. How do you escape responsibility by not voting? True, good candidates are rare, so why don't you run? Obviously you believe you're better than those you refuse to vote for, so why aren't you doing something? Doesn't the City of Arcadia fund much of the Chamber's activities there? Do Scott's opinions represent the City Council? Yes it does. Without the City's funding Scotty Boy wouldn't have anything to blog about. That's why he cannot bite the hand that feeds him. Good boy Scotty! Hettrick's blog entry has no doubt been vetted, or maybe even created, by Wuo, Chandler and Tay. He'll provide the cover that the players need to get their evasions and whines across. Do they scratch Scotty's belly? I thought that ground permeability was also a real problem with McManies. Destructive to the water cycle, just what we need more of now. Scott owns, publishes, and writes for ArcadiasBest.com. How much money does the Chamber of Commerce get from Arcadia? Hettrick is a sock puppet for the pro-over-development forces on the council. To stop the destruction of Arcadia, they'll have to recall the tres amigos on the council, and fire this guy too. That said, I'm really sorry to say, I think it's too late, and that town is over and done with. Mistress MacMansionville has replaced Arcadia. 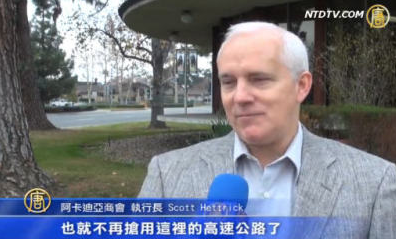 Love the still picture of Scott on Chinese TV. Any idea what that report was? Something to do with easing traffic congestion. WE THE RESIDENTS OF SIERRA MADRE NEED A SMALLER GOVERNMENT. I hear a rumor that they'll be less caps and double spacing as the UUT sunsets. A retired elementary school teacher in Sierra Madre answered the phone to hear Sandy's voice asking her to vote for her in the school board election. The teacher tried to get some answers to questions that she faced as a classroom teacher and Sandy was not interested in continuing the conversation. The teacher took that to mean that she had no background to draw from to answer a sincerely put question. Needless-to-say the retired teacher voted for Sandy's opposition. The retired teacher voted for Torres because said teacher was stupid. I voted against Torres and I'm not proud of it. Think they call that the lessor of the two evils.